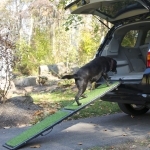 Getting in and out of a vehicle can become very difficult for a pet as it ages, which is why the Gen7Pets Natural-Step Ramp is so important. When a dog is going up a hill, the tendency is to use its claws to get additional grip. The Natural-Step™ Ramp with poly grass allows the dog to get a grip and feel secure while walking up a soft surface that will not scratch its paw pads. The grass is also soft to the touch for the pet parent and will not scuff or scratch interiors of a vehicle.